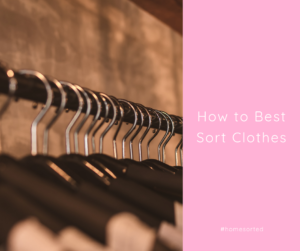 How to Best Sort Clothes - Home Sorted! Are you looking for a way to make getting dressed of a morning easier? We want you to look and feel your best at all times, and this starts with your wardrobe. Keep reading for our tips to best sort clothes. The best way to sort clothes is to start with a selection that you want to and will actually wear. If you have a whole bunch of items that haven’t been worn in six-plus months, it may be time to reduce the clutter. We recommend removing all items from inside your wardrobe and drawers to effectively evaluate what you own. This also allows you to identify any items that you need to purchase for upcoming seasons. If you have a tendency to hold onto items for sentimental reasons, it may also be a good idea to have a close friend over to help with judgement calls. Think of reducing the clutter as a way to help your wallet and others. Items that you no longer wear can be sold (for profit!) or donated to charity. In our professional opinion, the best way to get truly sorted is to organise your drawers by type. This means designating a drawer for underwear, sleepwear, tops, bottoms, activewear, etc. Of course, this will depend on the particular kinds of clothes that you own and your number of drawers, but it’s a good rule of thumb to start with. Do you find yourself constantly digging through piles of winter clothes in summer? If this rings true for you, it may be time to consider seasonal storage like vacuum seal bags. These are a great option for placing bulky coats or sweaters in storage – in turn, freeing up valuable wardrobe space. Another great tip is taking advantage of storage areas such as hallways cupboards or linen cupboards. If you have extra space available, these can be great places to store coats, shoes, accessories, and occasional wear. This can be as simple as keeping a garment bag of coats in the hallway cupboard or placing a shoe rack along the bottom of your linen cupboard. The takeaway message here is that clothes storage doesn’t need to be conventional to be considered best.